This blouse is versatile, elegant and can be worn in many ways. Cecilia comes with a loose sash that can be worn as a belt, a scarf or tied as a bow at the collar. 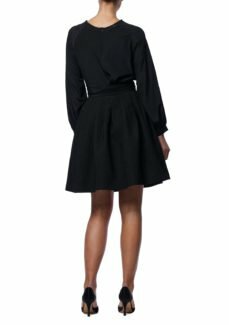 Is has a rounded seamless shoulder and a zip at the back, creating a sleek neckline and a clean silhouette. Cecilia is made from100% thin silk crepe.